Funny how I never stop finding things to talk about when it comes to hiza guruma. Today's piece of advice? Take notes, kids. Here it comes. Your job is NOT to STOP uke's leg or knee with your foot. But that's exactly what everyone tries to do, and that's where we get two guys kicking each other and beat-up shins and all kinds of frustration. Think about it: if his leg is coming forward and I'm trying to STOP it, that's force against force! And that, my friends, definitely ain't judo, is it? Where is tori's his foot? In FRONT of uke's knee? Nope, it's curved and cupping the FAR SIDE of uke's knee. 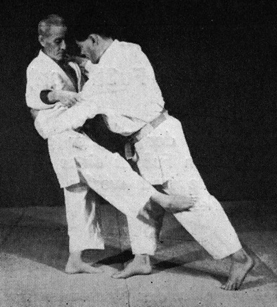 After years of having people throw me by trying to stop or impede my forward step in uchi komi or a very acquiescent session of nage komi, I noticed my fall was a typical tobi ukemi—which is more of an otoshi type of fall. Where was the guruma, the turning? Try this: instead of stopping uke's knee, reach out with your sneaky little monkey foot, cup the far side, and re-direct it's forward motion by adding a sideways vector, tucking it closer to his other knee (while doing all the other appropriate stuff, of course). I think you'll find the fall, as uke, is a little different; there's more of a roll to it, and the ground comes up to greet you a lot faster. I think you'll also find you do a lot less kicking and smacking. And remember, it's gotta be the knee, not just below the knee and certainly not the calf or shin. The knee. What used to be one of my most frustrating throws has become on of my favorite, if only for the sheer fact that I'm always learning something new about it. Many deep, humble thank you's to all the sensei I have had the pleasure and privilege of working with, for sure.